WEST’s 2NT was the Unusual Notrump, showing at least 5-5 in the minor suits. A response of 3S by North now would indicate a normal raise to 2S. That’s because you cannot afford to be shut out of the bidding when you hold support for partner. Holding a genuine 3S response, North should make a cue-bid in one of West’s suits. North-South, here, used 3D for this purpose. How would you play 4S when West leads the king of diamonds? Declarer ducked the opening lead, an essential move, won the diamond continuation and cashed the ace of trumps. When West showed out, he crossed to the king of trumps, took the marked finesse of the 10, and drew the last trump. A diamond ruff was followed by the two top hearts and a diamond exit. West had to win and he cashed another diamond. Then, with no hearts left in his hand, he had to lead away from the king of clubs. Ten tricks made! 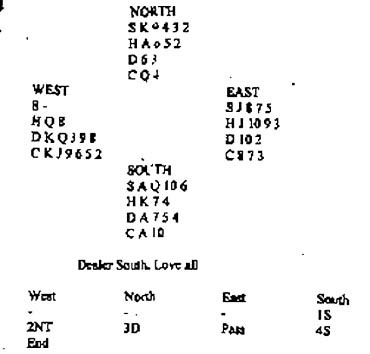 Once West had shown void in trumps, declarer needed him to hold only two hearts (or to fail to unblock when holding Q-x-x). Ideally declarer would like to duck a heart, before ruffing a diamond, to cope with 0-3-5-5 shape with West. It was not possible here because East would play a club through declarer’s ace if he was allowed to gain the lead. It would not be a sound move to double because partner might well respond in diamonds, where you hold only a doubleton. An overcall of 1NT is best. This shows the values for a strong 1NT opening, along with stoppers in both of the opponents’ suits. If you decided to pass instead, I have no arguments at all with that. When you partner is very weak, a Pass might work out best. Awards: 1NT - 10, Pass - 8, Double - 5.